The nice thing is that game updates don’t clutter your main stream, but this also means that the stream will no longer be comprehensive and it will be difficult for a game to become popular in a short amount of time. For now, there’s a small number of games from companies like Zynga, Rovio (Angry Birds), PopCap Games and it’s interesting to see that the games APIs aren’t publicly available. “We chose to start with a small number of partners so that we could experiment, get the kinks out of our APIs, and get real end-user feedback before opening up to the world. (…) Because we want to provide both a great user experience and a great developer experience, we’re focusing on quality before quantity. We will continue to add new partners and new features in small steps, starting with today’s release of the games APIs to a small number of developers,” explains Google. Games aren’t available to all Google+ users because the feature is slowly rolled out. When you see a new tab at the top of the page, next to the search box, you should be able to play games. 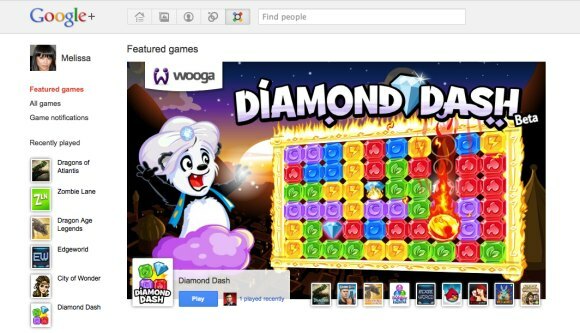 Google+ games are social. When you play a game, you can share updates with your circles, buy virtual goods, send gifts, invite your friends. “Additionally, a game may involve multiple players in a single match (such as a poker table). In these situations, the other players in the room can see and interact with each other during gameplay. Some games allow you to partner up with (or work against) another player, such as a neighbor, ally, or an enemy/rival. These games use your circles to suggest people to interact with. You could show up as a suggestion to another player to become an ally or to challenge,” mentions Google.